Jen, So glad to hear that you passed the written part of your driving test. It is hard for me to imagine not having the freedom or luxury of driving my car everywhere I go. Best luck of the driving portion of the test. Enjoy the beautiful signs of Spring as you are out of your daily jaunts and the most beautiful signs of Easter in all of the shops of your little town. Just finished reading your book and just wanted to say how much I enjoyed it. We spent 10 days in Montepulciano last year and your descriptions of the town brought back many happy memories. Keep up the writing, I’m looking forward to reading your next book! Thank you so much for your lovely note! I am happy you enjoyed the book. Montepulciano is indeed a special place! If you have a chance to write a few words on Amazon, rave reviews are always appreciated. My publisher is small so it helps get the word out!! Thank you again!!! And stay tuned, book 2 is in the works and I hope it will be out by the end of this year. I just finished reading “At Least You’re in Tuscsny” for the second time. What a fabulous read. The next best thing to being there. I settle into a cozy arm chair, put on the Mario Lanza cd , pour myself a glass of wine and totally lose myself in this book that wraps aroubnd m e like a warm hug. Brava!! So are you going to write a blog about the driving part of your license exam? I may have to do this one day, and I’m so NOT looking forward to it. Well, maybe more fearful of the written part, because my Italian is not so great yet. 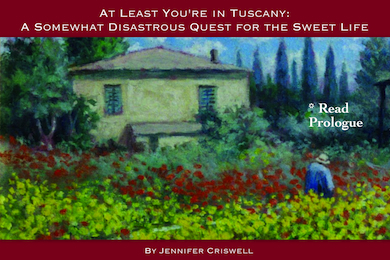 Loved “At Least You’re in Tuscany.” I wonder if you’d be interested in writing a guest post on my blog? Hi Paul! Thanks for your note. I am working on a follow up to At Least You’re in Tuscany and it definitely will have a chapter on the driving adventures. I am trying to get the book done in the next couple of months, but if you don’t mind waiting a bit, I’d be happy to write a guest post. Thanks for you kind words on the book and if you have a few moments to put up a review on Amazon, it would really be appreciated.